At The Learning Academy Employment Services, we offer businesses solutions to meeting your diversity goals by customizing employment for individuals that are reliable, competent and talented. Business leaders understand that having a diversified and inclusive workplace enhances recruitment and retention of valued employees and can increase your customer base. We have created a win-win opportunity for both the business and the potential employee. Providing three types of job services, we can offer employers varying levels of support to develop long term and loyal employees. Our representatives will work with your management team to train new employees we have matched to your available position and monitor the employee through the first year of their tenure in your business. As our goal is to provide an employee that is successful in meeting all job expectations, we will be available for consultation to ensure this outcome. What's the benefit to you as an employer? In addition to recruiting a great employee who you can count on, you receive support and consultation at no cost for a year after the employee is hired from The Learning Academy Employment Services representative assigned. There are also various tax incentives available for hiring an individual that we place in your business. 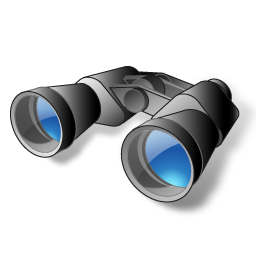 Looking for the best match for your position vacancies? Let The Learning Academy Employment Services help you find and develop the right people for the job while building a diverse and sustainable workforce within your business. The Learning Academy Employment team is ready to assist employers with their training needs on various topics related to employing neurodiverse individuals. From overview trainings to specific strategies in the workplace to promote success, we are prepared to tailor trainings to your needs at no cost. You can contact us to request training at 813-974-2840. We have listed webinars of interest for employers to view at their convenience as well as materials we have created. Do you currently employ individuals with autism spectrum disorder (ASD) and need tips on how to create a successful work environment? Looking for ways to improve your supervision techniques for your neurodiverse employees? Do you want to learn how to cultivate long-term productivity? 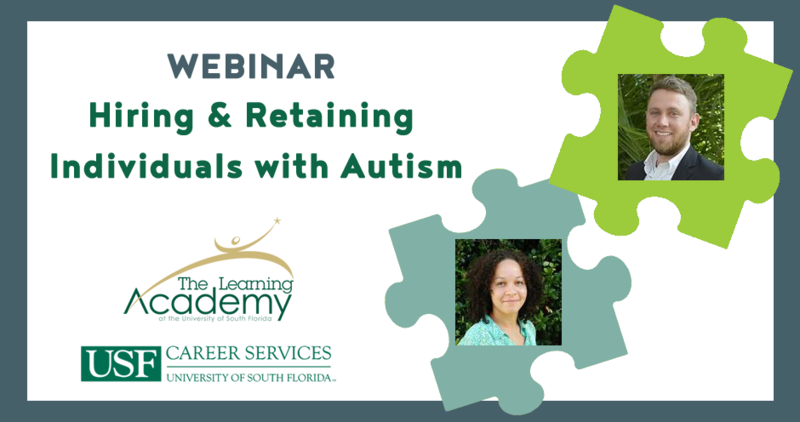 This webinar by USF Career Services and The Learning Academy at USF explores managing and supervising individuals with ASD. Featuring Scott Fontechia and Christine Hugh, this webinar will provide participants with examples and strategies drawn from their close work with businesses over the years. 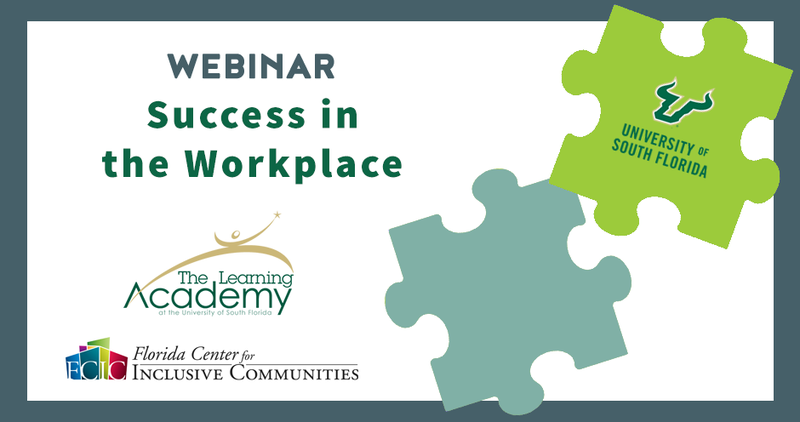 Tune in to learn about methods that work for individuals with ASD as well as all other employees. The webinar will also provide participants with information about accommodations. Has your organization considered hiring an individual with Autism but you weren't sure where to start? Do you currently employ individuals with Autism and need tips on how to create a successful work environment? 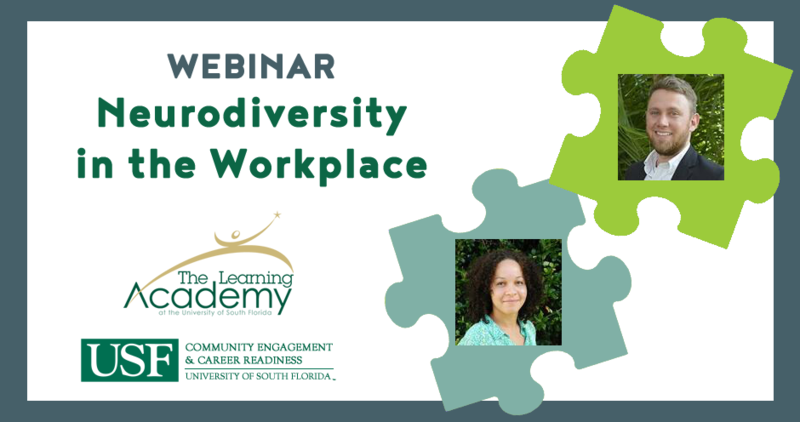 Join USF Career Services and The Learning Academy at USF for a webinar on hiring and working with individuals with Autism Spectrum Disorder (ASD). Featuring Scott Fontechia and Christine Hugh, this webinar will provide participants with examples drawn from their work with ZooTampa at Lowry Park, PwC, Enterprise Holdings, Transportation Control Systems, and Ukulele Brands. The webinar will also provide participants with information about the variety of incentives and resources available for employers who hire individuals with ASD. Attendees will hear an employer's perspective on success in the workplace. The employer will share both her journey as a manager and direct supervisor of an employee who was provided employment consultant supports and workplace accommodations to gain and retain employment. Participants will have an opportunity to learn what the workplace needed and how their needs were addressed to support the employee successful performance on the job. The employer will also share the positive impact the accommodations provide to existing employees and new hires in their workplace.